There are multiple secondary players who might very well face legal consequences for their part in the now debunked and dangerously divisive Trump-Russia collusion narrative, but with the possible exception of former Obama era CIA Director John Brennan, no figure was more central to the rollout of said hoax than former Obama era FBI Director James Comey. It seems Mr. Comey is not doing so well these days. If there was ever any question that former FBI director James Comey has been blowing smoke up our backsides since the moment he got fired in May 2017, his interview with NBC News’ Lester Holt on Wednesday night removed all doubt. With the possible exception of former CIA director John Brennan, he of “I can’t talk about the classified information that informs my judgement, but trust me, Trump’s a compromised Russian stooge” infamy, no one had a more uncomfortable Saturday afternoon than one James Comey. Comey’s no neophyte in the ways of the swamp. He knew that four-word answer would lead every newscast, and that his repetition of that answer would sustain the story for at least as long as he had another interview on his calendar. And it worked—all of it. Within a year of his firing, Comey had singlehandedly engineered a special counsel investigation into the president who fired him, and seeded into the national psyche reason to believe that the president was a compromised traitor. If the former director of the FBI, his mind teeming with sensitive and classified information, tells us it’s possible the president is compromised, then it’s a pretty good bet the president is compromised. The media took their cue from Comey and ran with it, while Democratic politicians amplified and expanded on it until it became a matter of faith among the political and pundit commentariat (and, not coincidentally, with at least half of the country) that the Mueller investigation was going to bring down the presidency. All of the former heads of the intelligence agencies were in agreement. James Clapper believed it. John Brennan guaranteed it. They each settled into a comfortable chair late Saturday afternoon, perhaps a celebratory cocktail at their side, and watched as Mueller and Barr brought their worlds down around them with the truth. They say the first stage of grief is denial, and, judging from Comey’s performance during his interview with Holt, they’re right. 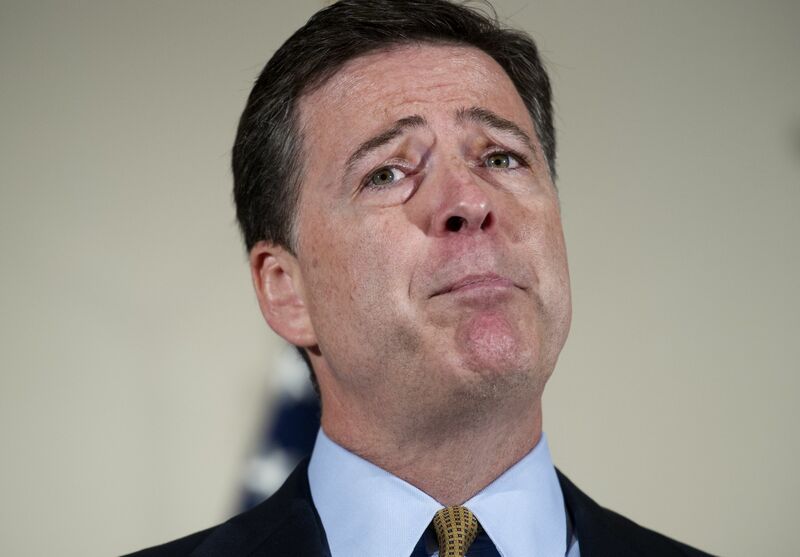 But even in denial, Comey maintained sufficient control of his well-honed shamelessness to pepper the defense of his singular role in orchestrating this national tragedy with lies delivered with a straight face. But that’s not what we see here. What we see here is a $25 million, two-year hostage crisis, wherein the president of the United States’ political and foreign policy agenda was handcuffed by an investigation he repeatedly told us was unnecessary and unjust, yet knew it was politically untenable to fire Mueller or use his authority to end an investigation he was certain would find no evidence of conspiracy, at least on his part. Which, we now know, is the elusive “what is true” Comey’s “honest group of people” were trying to find out. In response to Holt’s statement that the Mueller report indicated there was “nothing between the campaign and Russia,” Comey quibbled with the language in the summary, keying on the word “established”—as in “the special counsel did not find that the evidence established that there was any conspiracy between an American and the Russians”—suggesting to Holt that there may be evidence in the report that falls “just short of that standard” and that we should wait for the report to come out. Comey’s play here—and remember, he’s in denial—is to introduce the possibility that evidence “just short of [the] standard” of “established” may well be of some determinative value once revealed, despite that fact that Mueller’s remit was to make that exact determination, whether or not the evidence established conspiracy or cooperation between the campaign and Russia. It didn’t. But Comey’s most blatant display of shameless duplicity was in response to Holt’s questions about Mueller’s indecision on the question of obstruction of justice. Comey told Holt that he was confused by Mueller’s inability to make a judgement, and by Barr’s decision that the evidence didn’t support a charge of obstruction. Oh, the humanity. If I had three wishes granted before I left this earth, one would take care of my family, one would guarantee another Cubs World Series victory, and the last would be that this complete fabrication, this poisonously viral canard, would once and for all be banished from the mouths of the simpering liars who regurgitate it in defense of their false narrative that Trump admitted he fired Comey to stop the investigation. I attempted to debunk it here. It’s since been thoroughly debunked by any number of Twitter accounts and various online publications—pretty much everyone who read the entire transcript except for the entirety of the mainstream media has debunked this nonsensical claim. The truth is in the context. Trump makes it clear in the rest of the Holt interview that he fully expects the investigation to continue under new leadership, and he looks forward to its findings. Holt knows this, because he was there. Comey knows this, as well. What Trump was saying in that infamous quote is, “The only thing holding me back from firing Comey was the perception that I would be interfering with the Russia investigation, but I thought, ‘This Russia thing is a made-up story and I’m not going to let it stop me from doing what I think should be done’ so I fired him.” That’s what he was trying to say. And you know what? He was right. This Russia thing was a made-up story, but Comey, along with Clapper, Brennan, and Strzok, fell for it and devoted the awesome power and resources of the premier investigative agency and intelligence community in the world to find their truth. What they got instead was the actual truth, and Comey proved Wednesday night that he’s not prepared to deal with it. One wonders if he’ll ever get from “denial” to “acceptance.” To paraphrase a famous professor of integrity, with time and a little bit of self-reflection, I think it’s possible. He’s a bad actor within a script written and directed by some of the most vile, anti-American forces from within our government.